In public. Where people could see me. Where I had to fake a sneeze and use a blanket to blow my not-so-runny nose. For it wasn’t just sad-movie crying. I was full on tears-running-down-my-cheek embarrassing crying. With the wetness running over my 12 hour stubble and ending up in the crevice of my neck. Captain Phillips made me cry like a little girl. I have to thank a few people for this little awkward moment on the plane. Thank you Luke for suggesting I watch the movie. Thank you Paul Greengrass for directing it and thank you Mr Hanks. Thank you for forcing open the tear ducts of my eyes at the end of the movie. Thank you for shocking my conscious mind into an abyss of sadness and empathy. Thank you for doing all this, whilst sitting on a plane in broad daylight, in clear view of several other passengers. Thank you. Very. Much. Luke suggested I watch the movie, which, by the way, I had no intention of doing. The premise of a violent abduction doesn’t sit well with my -made-for-superhero-movie-brain. And the whole based-on-a-true-story hook did nothing to encourage my desire of spending three hours battling through boredom. How wrong was I? Not only did Paul Greengrass manage to deliver a showcase of anxiety and tension I barely lived through. He turned on-screen characters into real people. Turning a version of a story into a bird’s-eye view. Allowing us to see people we know. And how they hate violence, how they fear death, and who those who has a strong enough desire to live, can turn into the heroes we all dream to be. And it happens slowly, in front of your eyes, like pealing an onion, layer by layer, exposing the courage every human has and the moments in life that causes that hidden courage to break through the surface. It’s an achievement of the will to live, but also the malice of money and desperation. But it’s the final moments of the movie that rips your heart out of your body and leaves it bare and exposed on a cold metal slab. Seeing Captain Phillips losing it doesn’t allow for any different emotion. Paul Greengrass took you on this courageous man’s journey. He takes you through the darkest moments, the desperation, the despair, the hope and fears of a man on the verge of death. A man’s who life is a fragile piece of porcelain in the hands of four slightly unstable, but desperate men. And once the Captain’s safe, once he realizes it’s all over and he is going home, he loses control…All control. Throwing all composure into the wind. And for the first time in the movie; this courageous man turns into a human. And it breaks your heart. 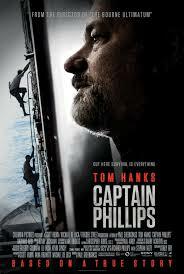 Tom Hanks forces you to experience the shock, the resolve, the absolute loss of control of this Captain. You see the moment when he realize that he is going to be alive after all. And that’s riveting. And it’s scary. And it’s raw. And it stays with you for a very long time. And it’ll make you cry. Like a little girl. ← Why alcohol is like gummi-berry juice. Ok, you’ve persuaded me. I’ll go and see it and I’ll take hankies. Can’t walk out if you’ve paid for the tickets. Got to get your money’s worth…. Well, considered yourself warned. It will change your life. I felt the same way. Boy did he deliver the most perfect performance in the last 10 minutes of that movie or what? Yes he sure did. And other actors have been Oscar nominated for far less than this performance. Good review. Goes up there as one of my favorite thrillers of last year for many reasons. The main which being that it never let-go of me, not for a single second. Thank you. I don’t write that many reviews, unless it’s something as special as this one… I was glued to my seat!! This film made me weep and weep and weep. I just thought it was one of the best performances I’ve ever seen, and it was so wonderful to see someone who’s gone through a terrible experience actually break down with the shock and horror of it all, whereas in most Hollywood movies of this nature,they simply go home, give their wife a hug, and make a funny quip about it being ‘all in a day’s work’. I can’t listen to that last piece of music without getting goosebumps. I agree. I agree. I agree!